You can use the admin page to see how much SPICE capacity you have overall, and how much of that you are using. SPICE capacity is allocated by AWS Region, so the information displayed is for the currently selected AWS Region. SPICE stores your data until you choose to delete it. You can improve performance by importing the data into SPICE instead of using a direct query to the database. All nondatabase data sets must use SPICE. SPICE capacity is pooled across users for the Amazon QuickSight account. All of your default SPICE capacity is allocated to your home AWS Region. The other AWS Regions have no SPICE capacity unless you choose to purchase some. To free up SPICE capacity, delete unused data sets from SPICE. For more information about deleting a data set, see Deleting a Data Set. 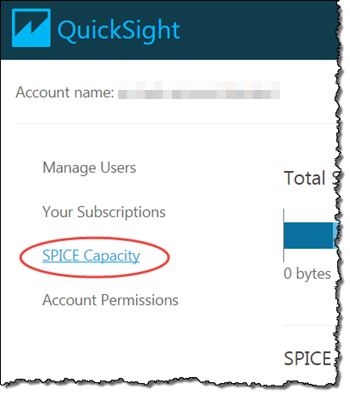 You can purchase additional SPICE capacity if you want to, up to a limit of 1 TB total capacity per QuickSight account. If you need an exception to this limit, follow the instructions at AWS Service Limits to submit a limit increase request. You can also release purchased SPICE capacity that you aren't using. Purchasing or releasing SPICE capacity only affects the capacity for the currently selected AWS Region. For information about additional SPICE pricing, see Amazon QuickSight. The amount of SPICE capacity a data set uses isn't the same as the size of its source file or table. The logical size computation occurs after all the data type transformations and calculated columns you define during data preparation. These fields are materialized in SPICE in a way that enhances query performance. Any changes you make in an analysis have no effect on the logical size of the data in SPICE. Only changes that are saved in the data set apply to SPICE capacity. In capacity planning for SPICE, consider what data types will be defined in the data set. For example, the file you want to import may contain all strings (text). But in order for these to be used in a meaningful way in an analysis, you prepare the data by changing the data types to their proper form. For example, fields containing prices are changed from strings to decimals, and fields containing dates are changed from strings to dates. If you create a calculation to make the conversion, you can remove the original field from the data set and substitute the formatted calculated field. In that case, you don't need to include the size of the original field in your capacity planning. Only included fields are stored in SPICE. Geospatial data types use metadata to interpret the physical data type. Latitutde and longitude are numeric. All other geospatial categories are strings. Use the following procedure to review your SPICE capacity and usage. 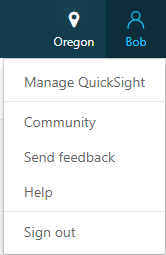 Choose your user name on the application bar, and then choose Manage QuickSight. If you are low on SPICE capacity, you can also choose the Buy SPICE alert that appears on the Your Data Sets and Create a Data Set pages. Free tier: This is the 1 GB of capacity associated with the free user that you get with every Amazon QuickSight account. Free bundled: This is the total default capacity associated with your paid users. You get 10 GB of default SPICE capacity per paid user. Purchased: This is the additional SPICE capacity you have purchased. Hover over any section of the meter to see details on that capacity type. Used capacity: This is used portion of the default SPICE capacity you get per user. Unused capacity: This is unused portion of the default SPICE capacity you get per user. Releasable unused capacity: This is purchased capacity that isn't in use, and so can be released to reduce costs. Hover over any section of the meter to see details on that usage type. Use the following procedure to purchase additional SPICE capacity. Choose your user name on the application bar and then choose Manage QuickSight. For How much SPICE capacity do you need?, type the number of gigabytes (GBs) you want to purchase. Use the following procedure to release unused purchased SPICE capacity. Before you begin, delete data sets that are using the SPICE capacity you want to release. To learn more about deleting data sets, see Deleting a Data Set. Choose Release unused purchased capacity. For How much SPICE capacity do you need to release?, choose Release all if you want to release all unused purchased capacity, or choose Release <amount> GB and type the number of gigabytes (GBs) that you want to release.